The big, and by big we mean huuuuge looks coming your way. Are you ready for winter… again? You might be once you check out these key menswear trends that are set to dominate your wardrobe later this year. The recent menswear shows across the globe have been showcasing a smorgasbord of inspiration for next winter. 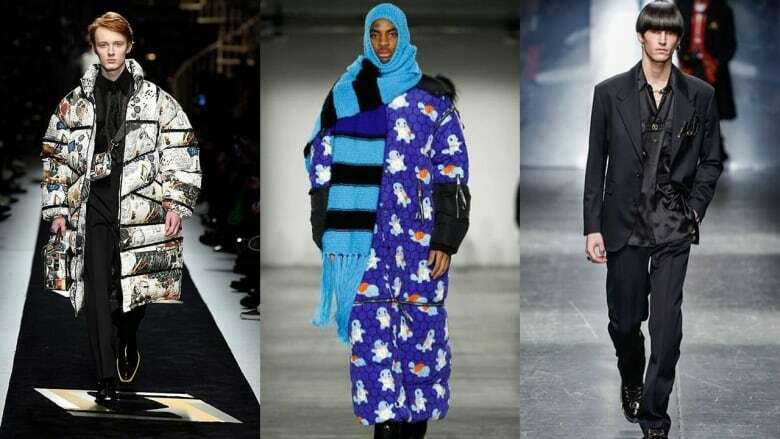 From double-denim, to (dare we say Canada-inspired) oversized puffers, scarves and bags, here is a look at six of the biggest trends from the Fall/Winter 2019-20 menswear runways in London, Milan, Paris and New York. Once a fashion faux pas, the Canadian Tuxedo is back. Spotted everywhere, it's set to be one of the biggest upcoming menswear trends. In London, E Tautz and Bobby Abley showed off their versions of the ultimate cool guy uniform. Louche two-pieces came down the runway at E Tautz's presentation, while Bobby Abley sent oversized Western-inspired denim chore jackets paired with matching oversized jeans down his runway — one a bold bubblegum pink iteration of the trend. In Paris, the beloved Canadiana double denim trend could be spotted on the runways of minimalist designer, Jil Sander and Korean label, Wooyoungmi. Meanwhile in Milan, MSGM founder Massimo Giorgetti debuted his fast-paced, racing-inspired collection, which included faded denim jackets and vests, worn with matching denim trousers. In New York City, Kee Kim's newly launched label Keenkee included an interesting take on the trend. A raw denim jumpsuit cut into a shirt, just below the belt loops, was styled with a pair of matching jeans for a look that showed off the new way to rock the look. Of course, the puffer jacket has been a bona fide trend since Balenciaga put them on their 2017 runway, but next winter the trend gets seriously oversized. It seemed as though every show in the London schedule featured the big and bulky, athleisure-friendly jackets. Iceberg under James Long in London, debuted oversized puffer jackets in bold, primary colours, while Cottweiler showed off oversized puffers in basic black. In New York, Todd Snyder showed off a collection that summarized America's sportswear obsession. During the show models strutted down the runway wearing sweats paired with oversized technicolor puffers. In Milan, Marni's creative director Francesco Risso took an offbeat approach to the upcoming trend: a pale lemon puffer (with a matching lemon vest) that's guaranteed to be noticed. Fendi pumped up the volume with simply enormous puffer coats. Meanwhile in Paris, Rick Owens turned heads when he showed off a collection of long line puffer jackets, the most dramatic in a trippy rust colour. Not to be outdone, Off-White's runway show, called "Public Television" (a motif present throughout the clothes), stole the headlines when Cardi B's on/off boyfriend, Offset, hit the runway wearing a floor-length duvet coat in lilac… Subtle. Back in 2012, Lenny Kravitz instantly became one of the most memorable memes of all time when he stepped out wearing a scarf big enough to be a blanket. Now, seven years later, Kravitz may get the last laugh… expect to see fashion lovers casually sporting blanket scarves next season. In London, Kent & Curwen (the fashion label co-owned by David Beckham) showed blanket-inspired scarves. Bobby Abley also showed generous scarves on the runway, although the British designer went one step further, wrapping them around model's heads. At the Sunnei runway show in Milan, the blanket scarves weren't as outrageous as Kravitz's memorable massive scarf, but they still made a style statement with their muted tones. Acne Studios' chunky knit scarves had fringes and were so long they touched the floor, while gents walked the Valentino runway at Paris' Grand Palais with oversized fine ribbed scarves thrown over one shoulder. Dunhill designer Mark Weston interpreted the oversized scarf trend differently, showing off sporty, shorter, though still sizable scarves in a puffer fabric. Designer Robert Geller returned to New York Fashion Week: Men's after a three-season hiatus and showed off a performance-driven collection spurred on by a new collaboration with Vancouver-born Lululemon. There, oversized scarves featured an ubiquitous moon-pattern print and bright neon colours. Bags have become a significant trend for streetwise guys in recent years, and later this year the trend will hit extremes. Enormous bags (some twice the size of those enormous hockey bags) were on the menswear runways in each city. Chinese designer Xander Zhou is rapidly becoming a highlight of the London Fashion Week Men's circuit, and his FW/19 collection was no exception. Models walked the runway with massive (and we stress, massive) shoulder bags that perfectly summed up the big trend. Oh, did we mention that one of the bags was carried down the runway by a Chewbacca-like figure? Designer Virgil Abloh kicked off the Paris presentations with an over-the-top Louis Vuitton show at Tuileries Garden that included a giant rucksack in grey felt with a subtle monogram. You may recognize it from the hundreds of memes that instantly flooded social media. Other labels jumping on the questionable big bag trend? Korean designer Juun.J created massive silver foil totes, Loewe showed oversized pink drawstring bags, and Hermès debuted an oversized, yet still sophisticated take on the classic Birkin shape. In New York, the bags weren't ginormous, but they definitely weren't subtle. At the Bode presentation, clear massive totes almost hit the floor and perfectly complemented the one-of-a-kind, handcrafted, gender-agnostic clothing. Animal print, especially leopard print, has been a regular part of the womenswear scene over the last few seasons, and now it's menswear's turn. In Paris, Celine, Sacai and Dior all confirmed that we are going to see animal motifs making a big impact for men this fall. At John Lawrence Sullivan in London, leopard print could be found on coats and bomber jackets, while some of the models strutted the runway wearing snake-print pants. The print played biggest in Milan. Neil Barrett asked "What is punk today?" backstage, before his epic 'Born in Britain' collection showed, with looks dripping in leopard print. Also in Milan, the roaring trend was seen incorporated into Scarface-inspired suits at Philipp Plein, while Versace's men wore long leopard-print coats with buzzed hair dyed to match. And it wasn't just leopard print in Milan. Canada's beloved Dean and Dan Caten, the brothers behind DSquared2, sent their models down the runway wearing multi-coloured fish-scales, while Emporio Armani featured a python effect on pants and jackets. Heads up: the colour black is returning as tailoring's go-to shade. The solid suit is the basic building block for any guy's formal wardrobe, but suits coming down the runway during the Men's Fall/Winter 2019-20 presentations were much moodier. In Milan, Miuccia Prada presented a collection that included single-breasted black wool suits, many of which were styled with multiple belts tied around the waist, cinching in jackets or resting on (gasp!) bare flesh. Also, spotted on the Milan runway beautiful black suits at DSquared2, Versace and Ermenegildo Zegna. In Paris, Dior's Kim Jones slicked up the trend, sending models down an airport-size moving walkway wearing black suits that had been styled with avant-garde style sashes. Black, oversized single-breasted suits floated down the runway at Valentino and Dries Van Noten. In New York, Theory's menswear designer Martin Andersson presented perfectly tailored black suits paired with layered knits for a more casual approach to the trend. But, truthfully, this is Theory's signature trend every season. Christopher Turner is a Toronto-based writer, editor and lifelong fashionisto with a passion for pop culture and sneakers. Follow him on social media at @Turnstylin.